There is a little new feature that is set to arrive in the Summer 13 release that garners only half a page of the release notes, but creates an extremely important opportunity for projects wanting to maximize their time and resources by leveraging clicks before code. In the past, Owner was a troublesome relationship field. Most relationship fields support cross-object formula references to access related parent data, but until the Summer 13 release, this has not been the case with Owner. Almost every sObject has this field, and in many, Owner can only be a user. But in Lead, Case, and custom sObjects, Owner is either a user or a queue. 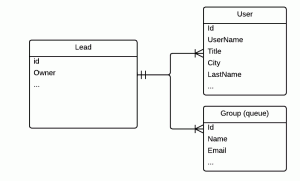 This means at the data model level, the field is polymorphic and can contain either a user or a group id value. That’s all well and good if the Owner value is related to a user. The User sObject has a field called LastName. But if Owner is related to a queue, my formula could potentially create a runtime error for the lack of LastName field in the Group sObject. There were workarounds. 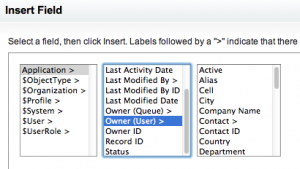 Most commonly, in an sObject like Account, where Owner can only be a user, it would be to use a trigger to populate a secondary lookup relationships field with the user ID on save. Ugh! With the advent of the cross-object owner formula feature, there is now native support for using cross-object formulas for all Owner fields. Because of the polymorphic nature of Owner, there’s a slightly different notation from other cross-object formula references you might have used in the past, but it is an easy adjustment. What about a formula field that displays the Owner’s Manager’s name? Or a validation rule that requires that certain status values are not allowed when the record is in a queue? We can detect the presence of either the User or Group parent type by checking to see if the Id field is blank for that type. Ostensibly this example would be a formula field showing either the Queue or User email address, depending on which is assigned currently. As a programmer, I enjoy solving a problem with code. That’s why Apex exists. But coding workarounds isn’t fun and the workaround for this in code was ugly and uninteresting. Not the kind of task I look forward to as a developer. As I implied at the beginning of this blog, in reading the release notes, you might infer that this is a small new feature. But for me it is almost as important as the addition of criteria-based sharing rules in the Spring 11 release a couple of years ago. Proper application of the declarative framework including formulas and rules can save a project hundreds of lines of code and days of work. With this addition to the platform, it further refines these tools in the toolkit for implementers. If the workings of the Owner field are new to you, take a look at the Overview of Force.com Security and this knowledge base article on permissions, or for some hands-on practice go through the Security Workbook. If you are unfamiliar with formula fields there are two help topics you should read, one on creating formula fields, and another on cross-object formulas. Make sure you check out all of our content on the upcoming Summer 13 release including the Developer Release Preview Webinar, the Release Notes, and the Summer 13 Release Training. So go sign up for your own Pre-Release Org and start preparing. Summer 13 is just around the corner. Finally a little introduction since this is my first blog post on developer.force.com. I’m Peter Chittum. I’m a recent addition to the developer evangelism team based in the UK. I’ve been working with the Force.com platform for the past three years as technical instructor teaching our developer catalog trainings including Building Applications with Force.com and Visualforce (DEV401), Apex and Visualforce Controllers (DEV501), Integrating with Force.com (DEV502), and Introduction to Object Oriented Programming with Apex (DEV531). I also hold the Developer and Advanced Developer certifications. I’m a huge fan of the Force.com platform, and in addition to teaching I’ve had the chance to work on a few pro-bono projects for our Salesforce Foundation customers as part of Salesforce.com’s 1/1/1 Philanthropic Program. Having just devoted the past 3 years of my life almost exclusively to Force.com I’m very excited at how this new job will be taking me into new and exciting technologies that integrate and work with the platform. You can follow me on Twitter on @pchittum where I post about work topics. Is the Build and Deploy a Free Cloud App track and Cloudforce right for you?